Send heartfelt greetings to people around the world, to bring them a smile any time of the year. More sets will be added each year - each set contains 6 of Conni Tögel's popular Sheep Incognito images on 5" x 7" folded card stock. Comes with six white envelopes. 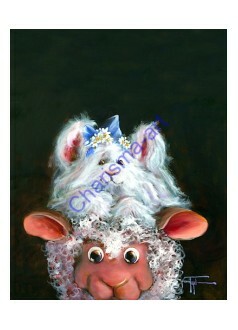 Hat Hare Sheep Incognito 5x7 Greeting Card -PDF This is a digital PDF file for downloading that w..